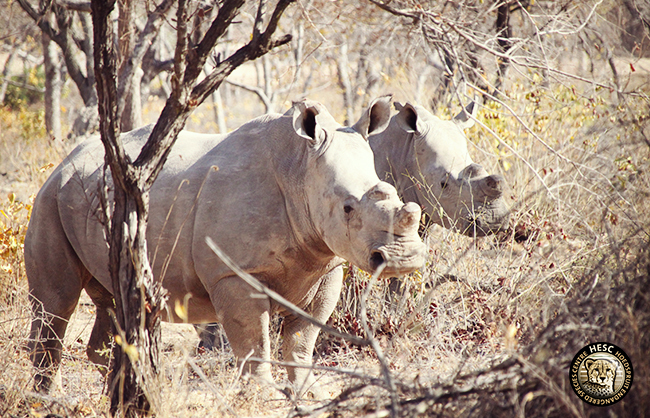 We never dreamed we would end up establishing a rhino sanctuary at HESC. But fate would have it differently, and we could never know how our course would change when we took acceptance of two rhino cows in 2013, which had survived a gruesome poaching incident. Lion’s Den and Dingle Dell arrived on the 30th of August 2013. Both their horns had been neatly cut off with a chain-saw, which left the animals’ sinus canals open and exposed, posing a massive threat. 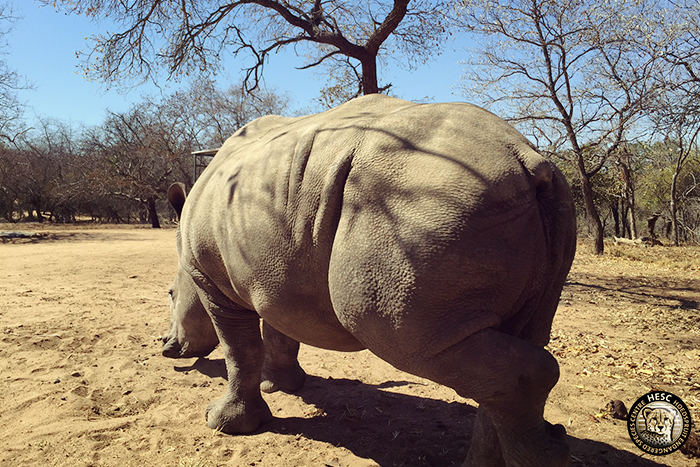 What followed was a laborious journey of treatment-after-treatment before both rhinos would fully recover. It took a few months before Dingle Dell was fully recovered, while Lion’s Den took longer – her process taking 25 treatments over a course of 23 months! 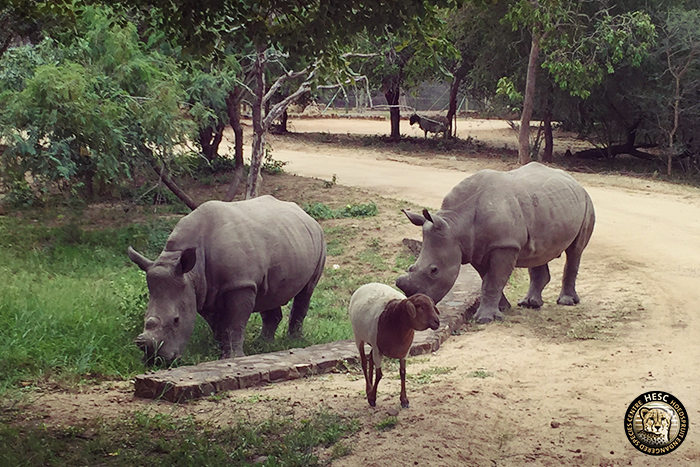 Both rhino cows have been fully rehabilitated and were recently dehorned. On the 7th of May 2014 we took in Gertjie who had been orphaned following the death of his mother at the hands of poachers. The 3-month old baby, anticipated to have been born around the 19th of February, was found next to his dead mother who had been tragically and brutally poached for her horn. It was a devastating sight, as the tiny animal would not leave her side, and was crying inconsolably for her. Since his arrival at HESC, as our first orphaned baby rhino, he’s had some important milestones from being weaned off milk formula to getting dehorned. Gertjie has also spent a great deal of his life at HESC with his sheep companion, Lammie, who has played surrogate to pretty much all the orphans we’ve taken custody of. Gertjie, however, holds a soft spot in Lammie’s heart. In November of the same year, we took in another orphaned baby rhino, whose mother had also been killed by poachers. We had to provide around-the-clock care for the very young Matimba who only weighed 60kg, to ensure he pulled through. Matimba means ‘strength’ or ‘power’ in local Shangaan, and true to his name he survived. Matimba, together with Gertjie and Lammie, became an inseparable trio. Their bond is still evident today. 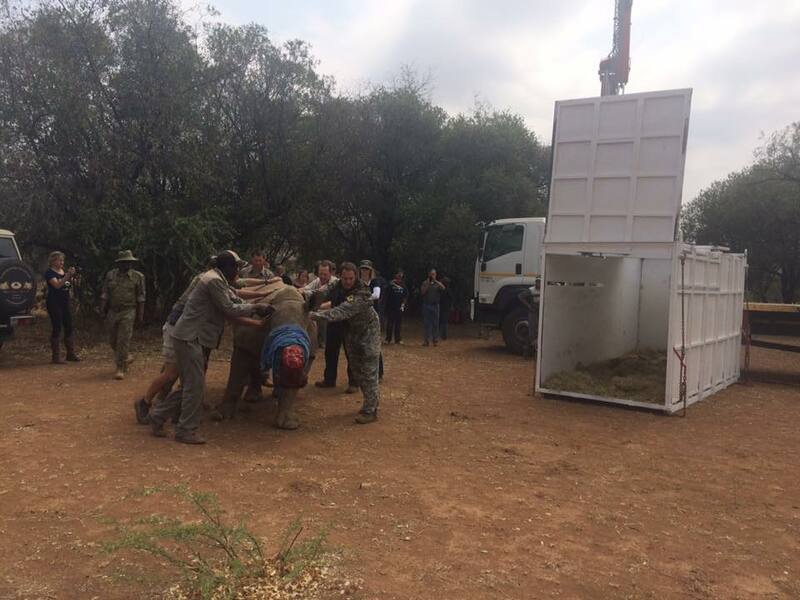 On the 10th of November 2015 a third orphaned baby rhino arrived in a critical condition. His mother had died as a result of injuries inflicted by poachers. Stompie was flown in by helicopter, his tail severely mauled from a suspected hyena attack. 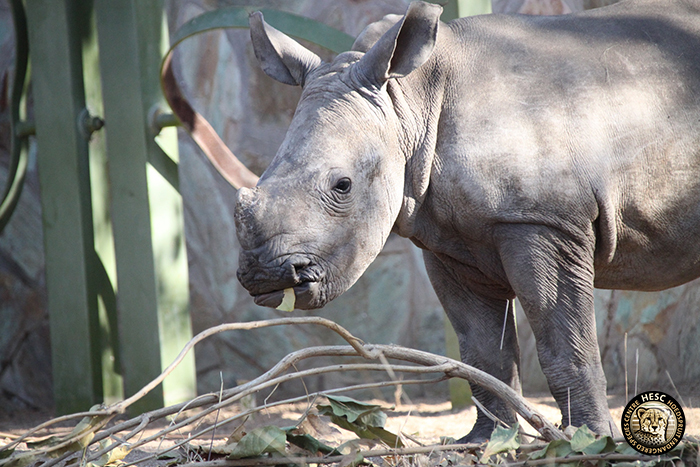 The approximately seven-month old rhino calf required reconstructive surgery. Stompie’s wound has since fully healed, following continuous treatments. As Stompie’s exact date of birth is unknown to us, we have been keeping track of his age based on his arrival date at HESC and his estimated age at that point. Based on this, we celebrated his 1st birthday on the 10th of March 2016. 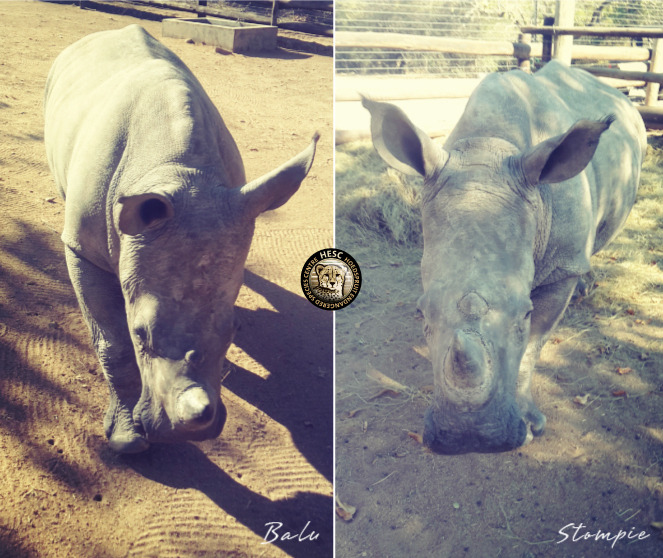 A few days after Stompie’s arrival we took custody of yet another orphaned baby rhino named Balu. At two weeks old, he was scrawny and barely weighed 54 kg. Although not much is known about the circumstances that led to Balu being orphaned, it was thought that he may have survived on his own for a few days without his mother. Balu was soon paired with Stompie, and Stompie now never leaves Balu’s side. The year 2016 had barely begun, when we received word of two female rhinos that had been poached at a neighbouring reserve on the 18th of January 2016. The older cow, unfortunately, died due to the injuries she suffered. She was pregnant and perished along with her unborn foetus. Her two-and-a-half-year-old calf survived with serious injuries, after her horn was hacked off with a chainsaw, and brought to the HESC. She was named Philippa, in tribute to a few great women who have been a part of HESC’s story. Since her arrival, Philippa underwent numerous treatments to clean and close her wound. Her most recent, and hopefully, final treatment was earlier last month. On Wednesday the 13th of April 2016, we took in Nhlanhla (also known as Baby N). Approximately 2 weeks old, a field guide at a neighbouring property had noticed him being rejected by his mother, as she repeatedly pushed him away as he tried to get close to her to suckle. No one knows for sure why she behaved in this way. Without intervention, Nhlanhla would have had no chance of survival. He was brought to HESC for immediate and urgent care. When he arrived he was exhausted, dehydrated and emaciated. Our team worked hard to rehydrate him, and gave him milk formula, which he responded well to. It took him just over 15 hours to urinate after his arrival – a good sign, as it showed that he was stabilising. Nhlanhla was also introduced to Lammie, but it took some time before the two were acquainted, as he spent most of his first days sleeping. Thankfully by ‘Day 2’, Nhlanhla was showing signs of improvement and seemed to be gaining strength. Unfortunately, Nhlanhla’s immunity was compromised because he hardly received any colostrum at birth, resulting in ongoing bouts of diarrhea. 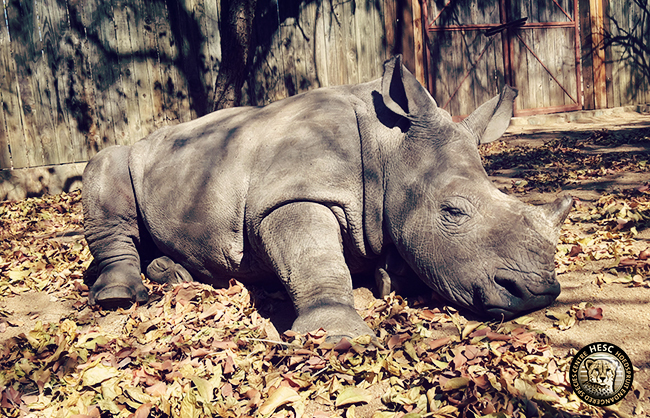 We are doing everything in our power to provide the best care for this baby rhino and restore him to full health. Almost two weeks after welcoming Nhlanhla, another orphaned baby rhino arrived on Sunday 24 April 2016. This baby’s mother was savagely mauled by poachers, and she was found next to her mother’s carcass. Olivia was approximately 2 to 3 months old and weighed 141kg. The poor calf was extremely traumatised and very thin on her arrival. We kept her in her own boma, as she needed the space to calm down. Fortunately Olivia was quick to ease in to her new environment. Today, she’s a happy, healthy rhino that loves a good belly rub, is very affectionate and adores attention. Muddy was the next orphaned baby rhino to arrive at HESC on the 4th of May. Sadly, due to unforeseen complications, this little one was only with us for a short time before he died on the on the 6th of July 2016. 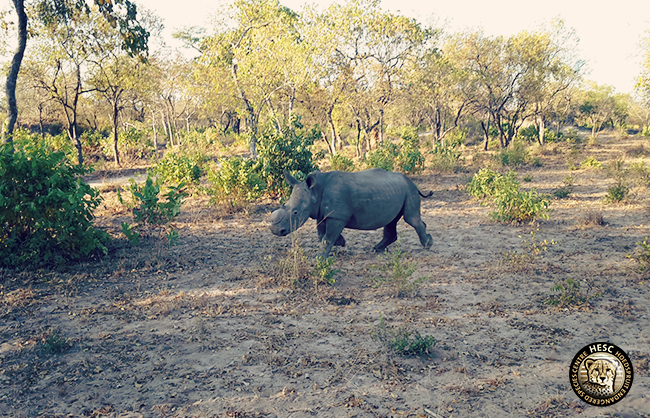 Shortly after Muddy had arrived, on Saturday the 21st May, we took in yet another orphaned baby rhino calf. 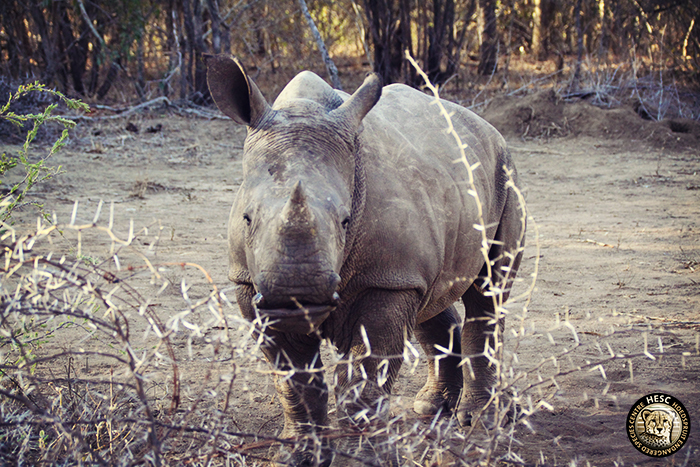 Named Khulula (which means ‘to rescue’ in Zulu), the female baby rhino was found roaming on her own at a neighbouring property. Her mother’s carcass was found in the vicinity with gunshot wounds, suspected to have been inflicted by poachers. Although the rhino cow’s horn was still intact, she was thought to have been dead for about 2 to 3 days. Khulula was estimated to be about 4 months old and weighed 136kg. She had a few scrapes on her back, possibly inflicted as a result of a hyena attack. It took Khulula a while to become accustomed to her curators, and she was skittish and aggressive at first (which is completely understandable after her ordeal). As time went on she became much more relaxed and comfortable in her new environment. Khulula has a gentle but vigilant nature. Just this week we welcomed a new rhino bull from the Pilanesburg Nature Reserve. Ike is approximately 5 years old, and a poaching survivor. For the past 14 months, he has been in the care of Saving the Survivors. Ike has joined our other three female rhino survivors, Lion’s Den, Dingle Dell and Philippa, to form the first hornless rhino herd. We are hoping that these survivors will start breeding soon. According to the Save the Rhino website, 1,175 rhinos were poached in South Africa during 2015, a slight decrease on the previous year when a record 1,215 rhinos were illegally killed. This is the first time the country has recorded a dip in poaching levels since 2007, when the rate of poaching began to escalate rapidly. Stop Rhino Poaching reports that as at 8 May 2016, 363 rhinos had already been poached thus far in 2016, compared to 404 this time last year. Minister Molewa of DEA has decided to withhold regular reporting of official stats to the public. The last detailed official poaching stats, which stand at 702, were released on 11th September 2016, for the period ending 30th August 2016. We will continue to take in rhinos in need, and to do what we can to protect this beautiful but highly endangered species. Every single rhino counts! As I read this and tears filled my eyes I realized that I am so emotionally involved with the wellness of these and all rhinos that it is now a natural part of me. HESC has inspired me to care in so many ways and to share the stories of these precious rhinos with everyone I know. Thank you HESC for your care of these magnificent creatures. I will be forever grateful to you. A very interesting article. Thank You for Caring. Sincere thanks to all of you for recognizing how much the rhinos needed you, and for stepping up time and again, day and night, to help them. And thank you for sharing their incredibly important stories with all of us who care from afar. Thanks to the team for care all these kind and precious rhinoceros. I hope to watch again on live webcam your nice residents before they released in the safe wild ! Long life to them !